Ms. Higgins: Thanks to you, Mr. Robert Chevalier, for organizing and attending this interview. Mrs. Busch, how did you happen to get to Matawan? How did your folks get here? Ms. Busch: Pop and Mom came here when Karl was born; I guess that was 1892. And before that, they lived down on Atlantic Ave. in Aberdeen Township. And then before that, they lived in Lawrence Harbor. Lena and Herman and maybe Karl were born in Lawrence Harbor. There were ten children in all. I'm second to the last. Mr. Chevalier: Tell us about the farm. Ms. Busch: Well, when I was born, Pop just had the five acres, and there were thirty-two acres across the street and fifty-three acres up on the other side of Lloyd Road, and that's what we farmed. Ms. Higgins: What kind of farming did your family do? Ms. Busch: Just general farming, vegetables, corn for the animals, because we did it all with horses; it was a lot of hard work. We had pigs in the pig house and we had chickens in the chicken house. We built the chicken houses in the 1930s, when there was a boom in the egg industry. Ms. Higgins: Chicken farming was big here. Ms. Busch: Yes, Pop built all the buildings in the 1930s. We had cows, and horses, and pigs. Oh, we milked the cows. My mother would always milk the cows. My mother was a really hard working woman, she always worked out in the fields very hard. After working in the fields one evening, Momma came in and was getting supper ready. Then, she sat at the table and I saw her fall asleep. I felt sorry for her, so one day I learned the technique in order to milk a cow. I went out in the barn and I milked the cows and brought the milk in. I came in and I strained the milk, and I took the cloth, washed the cloth out, hung it up whereMom had it hung up. After she woke up, she went to milk the cow. She said something about the cow being dry. I said, "What's wrong with the cow?" She said, "I didn't get any milk." Then Momma came in and went to strain the milk and the cloth was still wet. She said, "I don't know what happened." Then she realized that I had milked the cows. Ms. Higgins: Did you tell her you had already milked the cow? Ms. Busch: That was a breeze job for Momma when she milked the cow. Ms. Higgins: How old were you? Ms. Busch: I was pretty young, about eleven or twelve years old. Ms. Higgins: So you milked the cow after that all the time? Ms. Busch: Oh, yes, it was my job to milk the cows; we always had two cows. I never worked in the house. I was a very poor housekeeper. I still am. Of course, I had a younger sister, Lillian, and she used to do the housework. My mother used to go out in the morning and get vegetables and she'd make a big pot of soup full of vegetables. We were raised all on vegetables. The only thing you got was a small piece of meat that we paid for at the butcher shop, and that was put in the pot. She'd take all the vegetables in the farm and she put them in a pot. Ms. Higgins: Oh, I bet that was wonderful. Ms. Busch: Oh, it was. Every summer as soon as school closed up, people from New York, Jersey City, Newark, and Elizabeth came down here; I don't know where they even slept. Ms. Higgins: Why did they come? What did they come for? Mr. Chevalier: Because their folks didn't want to have them sitting around in the summer getting into trouble. They came for fresh air, too. Ms. Higgins: They came to your farm here? Mr. Chevalier: Yes, oh, yes. They stayed here all summer. Ms. Busch: Yes, as soon as school closed, they'd bring their kids down and they would leave them here until it was time for them to go back to school again. Ms. Higgins: Well, that gave you plenty of playmates. Ms. Busch: Yes, oh, yes. They were all younger than me; and I was the boss. Ms. Higgins: What kind of games did you play? Mr. Chevalier: I don't think we really played games. But see there's a creek here; Mohingson Brook runs through the property, and they spent their time there. At noontime they would come home for lunch. Ms. Busch: Papa would lie down and go to sleep. Papa would take his nap, and we'd go down to the creek and follow the creek all the way up to Lloyd Road and come back again. Of course, it was the hot part of the day, you know. Ms. Higgins: That's the creek I crossed over to come here. What about the old mill? Ms. Busch: On the other side of the creek, there was an old mill, I don't know how many hundreds of years old it was, that had a millstone. It had an outside water wheel that provided the power to grind up the flour, and all the rich people in Matawan had an investment. It was built in the Township, but the owners lived in the Borough. Of course, it was all Matawan and there was no Aberdeen then, it was all Matawan. Mr. Chevalier: It was Matawan Borough and Matawan Township. I don't even know when it split. Maybe it was all one at one time: I don't know. Ms. Busch: According to the old deed, this was all one piece of property. The mill used to grind the flour there and all the aristocrats in Matawan had an interest or investment in that mill. I don't remember too much about the transaction because I was a baby. Oh, my brother and sister went over there to play. In order to get up the stairs, I had to carry my little sister Lillian. 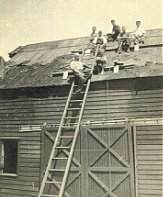 We used to always like to go up in the hayloft. The millstones are there still. They used the top of the old mill to store hay for their animals, and the animals were downstairs. Ms. Higgins: So now, your mother was working, your father was sleeping, and you children are playing in the mill in the hayloft? Ms. Busch: Yes. That was our recreation. My youngest sister Lillian was so small, I carried her, and we used to have to climb steps, because there wasn't a ladder there, and there were boards and nails between the beams that you had to watch out for; that's how we climbed upstairs. We used to go out into the field and cut the hay and take the hay down there. This was all with horses; and you took the hay and threw it up in the hayloft. Rob's mother, my sister, and I used to always get the job way up in the top of the mill, way up in the eaves, to push the hay back. Ms. Higgins: Is that because you were small and could fit in there? Ms. Higgins: Did you ever ride the horses for fun? Ms. Busch: Yes!! Oh yes!!! I had a stallion that I used to ride around, and of course back in those days, getting on a horse and riding the horse at that stage was terrible. Ms. Higgins: Let alone a stallion. Ms. Busch: I used to ride down Lloyd Road and all around. Ms. Higgins: What was his name? Ms. Busch: Prince. Oh, we had so many horses. Prince was a white horse, and Tom was the other. Ms. Higgins: And did you ride the horse to school? Ms. Busch: No. We walked to school. When we went to school in the wintertime, when we had had a really bad winter storm, up here on the hill the snow was from one hill to another, and we'd walk over here and walk in the field up over the hill to go to the school. It was about a mile to the school. Ms. Higgins: Did you stay there all day and have a nice hot lunch? Ms. Busch: No, we'd get out at twelve noon, and come running home for soup, a big pot of soup. We'd come home and get our hot soup and then we went back to school again. I guess that's why I have lived to be ninety-four. Ms. Higgins: How did your family preserve all the vegetables that they grew? Ms. Busch: There was no cellar in the house. My mother didn't like that, she wanted one, so she went in the front and started digging the dirt out. Of course, us kids had to take this dirt away. I don't know what year it was. Then we had somebody in here to raise or jack the house up. Ms. Higgins: Did you raise this house? Ms. Busch: No, no the other part of the house. Mr. Chevalier: This part is 1918. Ms. Busch: But the other part is all beams and the walls all filled with rock; brick lined. Ms. Higgins: And this was lifted? How did they do it? Ms. Busch: They had four screw jacks on each corner of the house and they went around from one to another and just turned them to raise the house up. There was a man in Matawan who lived in back of the school who did that. Then he built a brick wall for us, along with the basement walls. Ms. Higgins: That your mother had dug out. Ms. Busch: My mother started digging it out, but of course, when the boys came along they all had to do it. We dug it all out. Ms. Higgins: I recognize the technique. Well, you obviously got a good education. Did you stop going to school after the Matawan School? Ms. Busch: No. I'm the only one in the family who went on; all the rest quit in the sixth grade and got a job somewhere. One went to the butcher shop, another to Harry's Blacksmith Shop in Morganville. Mr. Chevalier: Talk about school. Ms. Busch: One year we had a terrible winter freeze and the snow was up on the hill from one hill to the other. We went up on people's property. We went up over the hill and I said, "Why do I go to school?" Ms. Higgins: How many children went with you? Ms. Busch: My sister and I were the last ones in the family, and we'd sit out here and wait by the road for the other children. Everybody would come down Church Street and the whole gang would come, and when they came we would leave. By the time we got to Matawan school, it was a big crowd of us coming. We didn't fit in Matawan, you know, we weren't aristocrats and Matawan was full of aristocrats. Ms. Higgins: I see. Where did they go on to school? Ms. Busch: I don't know. Mr. Chevalier: They got their own private schools, too. Ms. Busch: Every weekend we would go to my grandmother's in Cliffwood. We'd go on a Friday night, and stay at Grandma's, and come walking home from Cliffwood to Matawan School on Monday. You know that's quite a walk. Ms. Higgins: That is quite a walk, yes. But the train left from here, didn't it? Ms. Busch: The train station was in Matawan, but it didn't stop in Cliffwood, and the next stop was South Amboy. My mother used to say that when she used to go over to Grandma's she would take the stagecoach in the morning and come back for school. We would leave Friday night and go to Grandma's and Monday morning we would leave Grandma's in Cliffwood and we would come walking on the tracks, even though we weren't supposed to walk on the railroad tracks. You had Aberdeen Road down below there. Grandma's was right on the highway, right down where the stores were. I don't know if the house is still there or not. Ms. Higgins: Tell us about walking on the tracks. Mr. Chevalier: It was an all wooden trestle across there. Ms. Busch: And of course, it was against the law, but it was a short cut right across from Matawan Creek. And we would go that way: it was another mile up to the school. Ms. Higgins: You said the Italians came to town and you'd all walk to school together. Ms. Busch: Yes, the crowd came, and then we would all walk to school together. I was the only one that went to eighth grade and spent a half a year in high school, and I wanted to go through high school, but Pop said, "No, Marie, you have to come home with me sometime and go to work." But it was funny: I had to come home from high school, but I could go to vocational school. 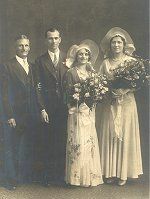 In 1920 my sister Bertha got married and lived in Sayreville up on the hill, and I was living with her, so I could go to vocational school in New Brunswick. It was an hour's trolley car ride from Sayreville to New Brunswick. There was a trolley car then on Main Street in Sayreville and we'd walk down and meet everybody; all the guys in Sayreville, the boys and girls; I lived there with my sister and it would take an hour to ride from Sayerville to New Brunswick to go to vocational school. Ms. Higgins: What did you study? Ms. Busch: Sewing and cooking and academics. In academics, I graduated as Valedictorian. Ms. Busch: See, vocational school only took dropouts in seventh grade. Ms. Mallock, my academic teacher, said to me, "Will you to get up and say Lincoln's Gettysburg Address?" Each student was assigned a paragraph. So she told me to get up and say it and I recited the whole thing. She didn't remember that I had gone to eighth grade and half a year of high school. I was the only one in the family to go past the seventh grade. My eighth grade teacher was Mrs. Gittens, and when she taught you something, you knew it. She was very strict about it. So when she said to get up and say the Lincoln's Gettysburg's Address, I went through the whole thing: "Four score and seven years ago, our forefathers...." In vocational school they put me in this office because I learned the whole thing by going through eighth grade and a half a year in high school. Ms. Higgins: Did your parents speak German in the home? Do you speak German now? Ms. Busch: Oh, yes, we could understand and speak German. I forgot it, though. Mr. Chevalier: Your mother only spoke German to the children. Mr. Chevalier: She could understand English and she could talk English, but she only spoke German. But Marie's father, he spoke in English, unless he got mad, and then he spoke in German. Ms. Busch: Yes, because in Germany you had to go in the army when you reached a certain age. And they wanted Pop to re-enlist. Pop said no. He couldn't do it, and came to America. Mom came to America, but she always wanted to go to Australia. This was all about 1880. Ms. Higgins: What an adventurous woman. Ms. Busch: But when she came to New York, Pop went to work in the sugar house, and in those days, while you worked you just had pants on. Mr. Chevalier: Well, I guess when she got to New York she wanted to earn enough money to buy her passage to Australia. Ms. Busch: Yes, that's what she wanted to do. Ms. Higgins: What was her maiden name? Mr. Chevalier: Well, it's Woge. Ms. Busch: In Germany, before she left, her father died and her and a girl from Poland said, "Come on, we'll get out." Mom said to the women, "Will you do the housework? And I'll go out?" Mom used to go out with all the men and work and bundle the hay. Well, I guess that's what she liked to do. Mom was a very hard working woman, very hard. In the morning she would make a pot of vegetable soup. Ms. Higgins: How did she make this soup? I love soup so much. Tell me about it what would she put in there? Ms. Busch: She'd go to a butcher shop, and she'd get a piece of meat this big, usually a piece of shin bone, and she put that in the pot and then she'd go out in the garden and she'd pick all kinds of vegetables out of the garden. That was mom's job in the morning. In the morning, she'd get this great big pot that would hold about five gallons, and she'd put all those vegetables in it. Mr. Chevalier: So did she cook it on the gas stove or on the electric stove? Ms. Busch: Gas, electric? Are you kidding? Wood stove! She'd put it all in the pot and she'd cook that and then we always had boys from all over. Everybody would say, "Can we leave our boy in the summer time?" All over Newark and Elizabeth and Jersey City and all over. The city people whose children were here would come on Sunday to visit them. Ms. Higgins: Were they Irish or African American, or Italians? Mr. Chevalier: Everything. I think there were a lot of Germans. Yes, I think they were mostly of German extraction. Ms. Busch: Evidently, everyone would ask to leave their boy for the summer. Today I wonder where in God's name they ever slept. Of course, when they go out in the field everybody had their work to do. Mr. Chevalier: What did you do in the morning when you first got up in the summer time? Ms. Busch: Milk the cows. Mr. Chevalier: And then what else? Mr. Chevalier: What about the asparagus? Ms. Busch: Oh, yes. Up by Lloyd Road up there, Pop planted asparagus. Ms. Busch: Come out of the ground. You had to cut it down near the root. Mr. Chevalier: It was very tender. Ms. Busch: We used to always have to pick those asparagus up before we went to school in the morning. I often wonder how we did that. Ms. Higgins: It's not supposed to get the sun on it, right? Ms. Higgins: And was it white when it came up? Ms. Busch: That was bleached asparagus. Mr. Chevalier: And then you didn't go to school. You stayed home and rested. Mr. Chevalier: How did you know it was time to go home and go to school? Ms. Busch: Mom was here by the big pot of soup, and she used to call from here, and we'd hear her way up on Lloyd Road. Then we'd come running home quick. Ms. Higgins: Oh, I bet that soup was wonderful. Ms. Busch: Yes. That was cooked on a wood stove. Ms. Higgins: Where did you get the wood? Ms. Busch: Anywhere. I had to go out and cut it. Mr. Chevalier: That was the winter project after the crops were all done. They had a big saw rig, and they would have these piles of logs, all sizes, and then they would cut them and they would have a pile, as big as these two rooms, of wood, which was the winter supply of wood. Ms. Busch: It was used in the wood burning stove and in the furnace here that heats the house. Mr. Chevalier: What did you want to be when you grew up? Ms. Busch: A nurse. I always wanted to be a nurse. The brain is so dried up, it's surprising how much you forget, but little by little it comes back. And I can still read the paper, thank God for that. Ms. Higgins: Well, you are certainly very, very pleasant to talk to and I am enjoying this. I interviewed a gentleman Friday who is ninety-four. He also liked Abraham Lincoln and was quoting from Abraham Lincoln, also. Mr. Chevalier: Is that right? Ms. Higgins: Isn't that amazing? He quoted from the "With malice toward none, with charity for all," speech. He has a lot of pictures of Lincoln; he loves Abraham Lincoln. How did you meet your handsome husband? Ms. Busch: I went to work in New York in the wintertime taking care of children. I took care of a little Jewish boy, I think he was two or two and a half. I used to walk him from 53th Street, all the way up to Grant's Tomb. I know he didn't walk all the way up to Grant's Tomb; I must have had a baby carriage. The family had a dry goods store, and the parents were down at the store when I was taking care him. I'd put him to bed in the morning, and after he took his nap he would get up and have something to eat. I'd make his lunch for him at noontime. Then, I got him all dressed and I'd take him down and we'd go to the store and I'd say, "Go say bye to your mommy and daddy." I could work until March, but when March came, Pop said, "Come on Marie, you have to come home. We have to make the hot bed." So, I had to come home and make the hot bed. Ms. Higgins: Wel,l that's a long walk you had in New York. You got practice going back and forth to school. Ms. Busch: When I got to Grant's Tomb, I would stop and sit down on a bench. He'd play around with all the kids in the park where all the kids would play. And then we'd sit there for a couple of hours. I often wondered what I ate. We ate lunch before we left. We'd walk back to 53rd Street and I'd take him upstairs and I'd get him something to eat. I saw how they lived in New York, and I saw beautiful homes. It's all different here. It's all railroad tracks. Ms. Higgins: How did you meet your husband? Ms. Busch: Well, that's another story. Ms. Busch: George Busch. These Jewish people I worked for had the back apartment and my husband lived downstairs where the store was. Mr. Chevalier: Go on about how you met him. 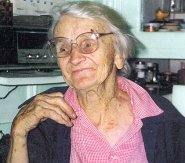 Ms. Busch: Sister Lillian and Bill Wuarman and George were friends, but I had not met him. The Buschs lived in the same apartment house as they did, but I never met my husband. They'd be downstairs when we visited New York. But I never met my husband until I was taking care of this little Jewish boy and Bill Wuarman called to George, George came back to meet me. George and my sister's husband were friends, and that's how I met my husband. I was introduced to him. Mr. Chevalier: What year was that? How long before you got married? Ms. Busch: I can't remember. It was a couple of years. Ms. Higgins: What did he do? Ms. Busch: George was working for a Gulf Oil company in New York. He had a good job at the time. Then Gulf Oil left there and the Depression came. And then George was the first one laid off. He had a good job in New York, then Gulf Oil moved to South America, and then he had to go get another job. He didn't want to go to South America. And George and my brother-in-law, Bill Wuarman, would come down on the weekend; he'd come down and spend the weekend, because he didn't want any part of New York City. We had the railroad to New York City. Ms. Higgins: So after you got married, you came back here to live? Ms. Busch: Well, he used to come here every weekend. Ms. Higgins: Why did he do that? Ms. Busch: Because he didn't like New York. Ms. Higgins: He liked you; I think that's why he came down. Ms. Busch: When he used to come down he used to go out in the field with me and work with me in the field. He knew absolutely nothing about field work, because they had a store. They owned a delicatessen store. Mr. Chevalier: Tell them about his parents. Ms. Busch: His parents came from Germany, of course, and they had this big deli with a grocery store on Amsterdam Avenue in New York. And then after a while, the store closed or they sold it or something. Mr. Chevalier: Where did your husband go to work after he lost his job? Ms. Busch: He had to go to work with his father in the deli grocery store on Amsterdam Avenue, because he couldn't find any other jobs. That was in that bad Depression we had, before 1932, so he had to work for his father, and traveled by train six days a week to New York City. Mr. Chevalier: What kind of car did you have? Ms. Busch: I forget, but I would take him down to the station and I'd drop him off there and wait until he went and got on the train, and he would go on the train to New York. I think he made twenty dollars a week or something like that. There was no money around during the Depression. Mr. Chevalier: What time did George leave to go to New York City to work? Ms. Busch: Oh, if I took him down at eight o'clock in the morning, he would usually come home earlier, but most of the time he would say, "Wait a while and take me down," and then he wouldn't come home until eleven o'clock at night. I lived in Matawan on Main Street at the time. Ms. Higgins: So you weren't on the farm then? Ms. Busch: Oh, yes. My brother Fred had a house over there, and I don't remember what we paid for it. It was a big house, and after I picked up George from the train, I used to take George home. We used to park by the street first and then the car got hit on Main Street in Matawan, so my brother Fred got a whole lot of barrels, great big tin barrel, and he made a driveway. So we could run down the back yard. Mr. Chevalier: The house was right next to a gully. Ms. Busch: There was stream there, and brother Fred took these barrels and he put these barrels in this way and this way, until he built a wall for our car to go down. I guess it was a Model A Ford. Then we could drive down the hill into the back yard. Ms. Higgins: That must have been thrilling. Ms. Busch: And we left it there. Mr. Chevalier: A gravel bank and a gravel driveway to go up and down the hill. What did you do all day? Ms. Busch: I took George down to the station to go to New York to work for his father. The monthly train fare to New York was nineteen dollars a month during the Depression. I would come drive over here to the farm, and then go out in the field. Ms. Higgins: Was this before or after you were married? Ms. Higgins: What year did you get married? Ms. Higgins: So he was working in the city and you were working in the field and he probably worked in the fields on the weekends during the season. In the wintertime, what did you do? Do you remember the rivers and creeks freezing over? Did you ever go ice-skating? Ms. Busch: Oh, yes, we used to go out ice skating on the lakes in Matawan. My sister and I used to always walk down to the lake in Matawan and go ice skating from Main Street to all the way down to the Dam. Mr. Chevalier: How about cultivating in the fields with your brother? Ms. Busch: My brother was three years older than I was, and my sister was three years younger than me. We'd go to school, and Pop would come down when we got home from school. Pop would have a cup a tea and something to eat, and he'd say, "Well, you clean the house." Of course, my sister didn't like outside work. I'd go outside with Pop and then work until dark. We'd work on the farm until dark. Mr. Chevalier: How about cultivating with your brother? They spread fish. They used to go to the fisheries and pick up garbage at the fisheries. Ms. Higgins: Fish entrails and all? Mr. Chevalier: The entrails and all the skeletons, and they'd spread them on the field. Ms. Higgins: I understand the American Indians did that with the fish, too. Ms. Busch: Vernon used to come and he used to always work with Pop, and Rob used to work with me in the field. Vernon and Rob are my nephews. Mr. Chevalier: How did they make hot beds? Ms. Busch: You had to dig deep and put manure in the bottom, and then you had to put dirt on top. After you put dirt on top of that and then we'd make rows and plant the seeds. Ms. Higgins: Was this farm still actively working and growing vegetables right through the Depression? Mr. Chevalier: When Levitts came in 1962, they sold the last piece of the big end of the farm, and were left with six acres. Ms. Busch: Of course, we never farmed this part then because we didn't need it. We had thirty-one acres over there. Mr. Chevalier: Another fifty-three acres all the way up to Holmdel Township, which is Line Road. If you follow Church Street all the way up to Line Road that was what they originally used to farm. Ms. Busch: And they used to cultivate it with the horses. Ms. Higgins: I was going to ask you if you had tractors? Ms. Busch: No. We had horses. Mr. Chevalier: Who did the cultivating? Ms. Busch: Fred and I did. Fred had a single horse with one cultivator, and I had the same. Mr. Chevalier: How did you do it? Ms. Busch: We cultivated down this row, and we went back up on this side, and went around that side, and came up on the next row. That's the way we did the cultivating. Mr. Chevalier: They used a single horse and a hand cultivator. A cultivator with maybe five to six teeth on it, and you just kept going. Ms. Busch: See, that's why I have the muscle. Mr. Chevalier: They used to plant in squares. Ms. Busch: Yes, so you could cultivate in both directions. Ms. Higgins: Your father must have had to hire help? Ms. Higgins: He did all that with horses and the family? Ms. Busch: We had kids from New York in the summertime. Ms. Higgins: But they were gone by harvest time, and that's the busy time. Ms. Busch: There were five boys and four of them were always here. When George and I got married, we used to go up to Freehold and pick up my sister Lil's daughter, and then from there we would ride over to Sayreville and pick up the Sayreville boys. Then they'd go to the movies and Lil had a fit, because her daughter was gorgeous and would see those terrible movies. My sister used to say, "I want you to stop taking my daughter to see those terrible movies." I said, "When your daughter is with my husband, he can take her anywhere she wants to go." Mr. Chevalier: Well, by this time, her sister was divorced from her husband, so she was a single mother. Ms. Busch: I was supposed to be the last one in the family and that is why I was named after my mother, because I was the last daughter born. But then sister Lil came along two years after me. Ms. Higgins: Are you in Matawan or Aberdeen? Ms. Busch: Aberdeen now. We were Matawan before that. Mr. Chevalier: Well, it was Matawan Township until they changed from Matawan Township to Aberdeen Township because of the confusion between Matawan Borough and Matawan Township. Ms. Busch: Of course we knew everybody then. Today you don't know anybody. And then when Levitt came, they took all the country, all the farmland. They built it all up, and they changed the name to Aberdeen. Mr. Chevalier: Where did you keep all the vegetables for the winter before you had the cellar? Ms. Busch: We canned them. We did a lot of canning. Mr. Chevalier: How about the carrots and the cabbage and the beets and things like that? Ms. Busch: Oh, that I can tell you. We would take a large piece of ground, and we would pack the carrots and the beets all the way around the bottom, and bring it up to a mound. Mr. Chevalier: With what did you cover it? Ms. Busch: Grass and weeds. We covered that all up, and on the south side of the pile we had a hole. It was all covered with hay and straw and everything you know so it would freeze, and then we'd dig out the dirt out of that side and bring out carrots and beets and stuff like that all winter long. Ms. Busch: Everything. We raised everything. This stuff would last all winter. After we got that big high mound made, we'd cover the produce up with all kinds of straw and all kinds of roots and everything. It was all covered up so it would not freeze. Ms. Higgins: Did you grow any fruit? Ms. Busch: No, we didn't grow fruit. Apple trees would come up by themselves. They were there when Pop came here. Mr. Chevalier: You grew raspberries. Ms. Busch: Oh, raspberries, oh yes. Mr. Chevalier: Marie still grows raspberries. Ms. Busch: Raspberries or strawberries. Mr. Chevalier: She was picking raspberries this year until, I think, the first part of November. Ms. Higgins: You're growing your own raspberries? Ms. Busch: Oh, yes. Everybody left home except my brother Fred. He stayed with me until the one year he planted tomatoes real early up along Lloyd Road and they froze. Mr. Chevalier: At night they covered the hot beds with big glass panes and then with salt hay, maybe ten to twelve inches of it, so in case you got a frost it would not freeze the crop. Ms. Busch: Before the tractors came, brother Fred had a horse and I had a horse. Not only our place. Pop rented ground all over. He planted corn for the horses and animals. And boy, I'm telling you, there was so much stuff to plant, and so much we grew. Ms. Higgins: Did the boys start to leave home then, during the war? Ms. Busch: Herman and Karl were in the war. Ms. Higgins: That's the First World War. Mr. Chevalier: The First World War, yes. They were in the army. Ms. Busch: Karl was in Germany. Mr. Chevalier: Yes. He got gassed in Germany with mustard gas. Was Herman in the war, or did he get out of the army before the war? Ms. Busch: Herman got out of the army, and then Karl joined the army. After Karl joined, he landed in Italy and came across to Germany. He had a set-back, too. And brother Fred is the only one that stayed home, because he and I did the farm work. Mr. Chevalier: Of course, her father did a lot of the farm work. He used to have a team cultivator, and he would cultivate the crops with a team of horses. He continued farming until he was pretty old. Ms. Busch: I think we got the tractor in 1950. Mr. Chevalier: No, we got the tractor in the 1940s. Edmond went in the army, and we got the tractor from him. Ms. Busch: Before that, I use to cultivate with horses. Mr. Chevalier: Everything was horses, then. Of course, the thing with animals is that you have to feed them when they're not working, which is from October until it's time to start doing things again. But you have to have enough corn and hay. Ms. Busch: We had a big corncrib full of corn that we used to feed the horses. And there was so much I forgot. Ms. Higgins: You remember a lot, too. Mr. Chevalier: How did you store the corn before you husked it? Ms. Busch: In the corncrib. Mr. Chevalier: How did you store it before you had the corncrib? How did you store it when it came from the field? Ms. Busch: We'd cut the corn stalks, bundle them, and stack them behind the barn. Ms. Higgins: Did you and your husband come to live at this farm? Ms. Busch: Yes. 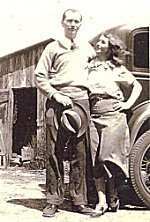 We got married in 1932, and I came home to take care of Mom. Then, my father stayed in the house. We lived in Matawan before that, and my sister Lillian moved into the house in Matawan. She lived in Grantwood, up in North Jersey, before that. Mr. Chevalier: How did you take care of your mother? Ms. Busch: In 1937, I came home. Mr. Chevalier: And how did you do it, what did you do? Ms. Busch: I cooked, cleaned, and washed everything for her. She used to sit in a chair by that big window over there, and the sun would be shining in. I took care of Mom until 1941. Ms. Higgins: Did you have children of your own as well? Ms. Busch: No, I couldn't have children. When I tried to have children and found that I couldn't, they examined George and found out that he had the mumps when he was eighteen years old. But he was a wonderful man. Anything I did was all right. He used to come down for the weekends before we were married, because he wanted to get out of New York. Otherwise, he would have had to work at his father's delicatessen store in New York on Amsterdam Ave. on the weekends. Pop Busch and Mom Busch had a grocery store on Amsterdam Ave. Well, they sold that and went into another kind of business. Pop said it didn't do so well, so that was when we made that apartment so they would have a place to live here on the farm. My mother-in-law and father-in-law lived in that apartment; they had a bedroom and a kitchen. They stayed there until they died. Mr. Chevalier: You still had chickens then, still quite a few chickens. Ms. Busch: Yes. And Pop Busch loved the outside. He used to go out and take care of chickens all the time. But all my other helpers had left. So I've got to do it myself now. But I don't care, I don't have too many chickens. Ms. Higgins: Do you have chickens now? Ms. Higgins: You care for thirty-five chickens? Mr. Chevalier: Yes, and a dog. Ms. Busch: My dog was in the house until Rob found me unconscious on the floor, and then I had to take the dog and lock him up in the chicken yard. Marie just kept going on. She didn't have sense enough to stop, and she conked out and fell on the floor. Mr. Chevalier: About seven years ago is when you got run over with the tractor. She was under the disk, her leg was under the disk, and she had seven broken ribs and a broken leg. You were in the hospital for a week. Ms. Higgins: You are some tough lady. Ms. Busch: But I had my set-back. Mr. Chevalier: About three years ago is when your sugar went crazy and you had a urinary tract infection and pneumonia. Ms. Busch: I lost weight. I didn't eat. Now I have a big fat stomach and a big fat fanny. Ms. Higgins: You need to get out cultivating. Ms. Busch: Yes. And then Rob found me unconscious on the floor. He put me in the hospital. I was in the hospital for three weeks. And then, from there, I went to a nursing home, and the nursing home is a place to go to get back in shape. When they get through with you, you're back in shape, believe me. Ms. Higgins: How did they get you back in shape? Ms. Busch: Well, they put you through this therapy. You go up on the platform, and when I first went on it, the nurse was right behind me. You put your hands in front of you and you walk on this platform. After a while, she didn't bother to walk with me. I could do all kinds of things. They have three therapy rooms, and when they get through with you, you're ready to go to sleep. They took me for therapy three times a day. Ms. Higgins: I think I will go back there and get into shape myself. Ms. Busch: I was there two days before I got out of bed when I came out of the hospital. In the hospital I got no care at all. The old gang would come sit around the bed. I wouldn't hear a word they were saying. All the family came and I just lay in that bed. The bed was up like this and I was laying on it like it were a board, but I said if I get the nurse to put me in a chair, she wouldn't put you in bed until 10 o'clock at night. Ms. Higgins: What nursing home did you go to? Mr. Chevalier: It's now called Madison Center but it was Emory Manor before. Ms. Busch: It's on the other side of Matawan, when you're going toward South Amboy. Ms. Higgins: On behalf of myself and this project, I just have to tell you that I've had a wonderful time with you. Ms. Busch: My life history. Ms. Higgins: Yes, and it seems to have done you well. And thanks to you, Rob, also. Ms. Busch: Thank goodness that I can at least still talk. After I came back from the nursing home, I didn't think I was going to last long, but they did a good job on me. I would recommend it to anybody. I think I had a full life, don't you think so?